← Female condoms – a technology for women with low bargaining power? Andy Dufresne lied to us. Hope is a terrible thing. It’s hope that gets you excited when England have twin centurions and six wickets in hand at 350-odd. It’s hope that’s kindled when a new fast bowler knocks off two Aussie top-order batsmen without any hassle. And yet, every time it offers you its helping hand, it yanks you in to deliver a pro-wrestling style kick to the belly. Needless to say, I was less than impressed by England’s collapse™, Craig Overton’s side strain and the inevitable soul-crushing Steve Smith innings I awoke to follow on Friday morning. Here to add to your weekly quota of disappointment is this week’s links. Fair warning: this one can be distressing to read. I had an enlightening conversation recently about how simplistic the coverage of the #metoo movement has been, and how much diversity in women’s experiences has been glossed over. This brilliant article by Claire Malone looks into one aspect of this diversity, pointing out how appallingly different the experience of poor, blue/pink-collar workers (often immigrants) who experience sexual harassment or assault has been. It’s a great piece of writing, considering social biases, the role of trade unions and precarity at work and if there’s hope for the future. A great interview with Anne Case starts with words I’ve often used: “what I love about economics is…”. Everyone should read this, especially the section on why women have a harder time in economics than men, focusing in part on the aggressive seminar questioning culture of the discipline (someone recently pointed out – correctly – that I buy into this, with my love of econ-arguments online). One thing I find remarkable (and great): a lot of the research they cite is by students or very young economists – Heather Sarsons is a PhD student and Alice Wu was, astonishingly, an undergraduate when she wrote her paper on Econ Job Market Rumours forum. Related: how to undo the gender bias in seminar questioning. 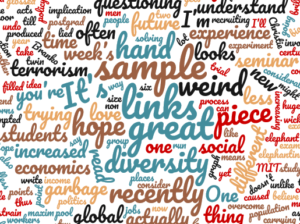 Christie Aschwanden considers the ‘weird sample’ problem in social psychology, and a hugely ambitious idea to overcome it (and with it, some of what has caused the crisis of (non-) replicability in the field). A weird sample happens when your study examines a group that is somehow very unlike the global population you’re trying to understand. For example, if you’re trying to understand self-control and your participant pool is MIT postgrad students, you have a weird sample. One way of solving this: pre-registering your trial and through this process recruiting people in very different places to run the same experiment, increasing both the size and diversity of the sample. Branko on what the future of the global income distribution might look like, and what that means for politics. I’m disappointed that this doesn’t consider the implication of the considerably less elephantine elephant graph he produced recently. I could probably have filled this week’s links with nothing but 538 links, actually – another excellent piece looks at the benefits and costs of increased community resilience to terrorism. Amelia Thomson-DeVeaux points out that while the attitude of carrying on regardless does reduce the impact of (and thus return to) acts of terrorism, they also tend to be accompanied by a closing in of the community, and increased mistrust of outsiders. A very good VoxDev piece on what South Korea’s much-vaunted industrial policy actually consisted of. Hope you had a great weekend, everyone! No links till the new year now – at which point I’ll try to round up my favourite pieces of 2017.